The canines are also known as the “eye teeth” and are one of the strongest teeth in the mouth, with the longest roots. Impacted canines are eye teeth that have failed to emerge from the gum because of abnormal growth, crowding, and rarely, growths on the soft tissue of the gum. When a tooth fails to erupt and is trapped in the soft tissue and bone beneath the surface, it is referred to as an impaction. The most common impacted teeth are the wisdom teeth, and the second most common tooth to be impacted is the canine. 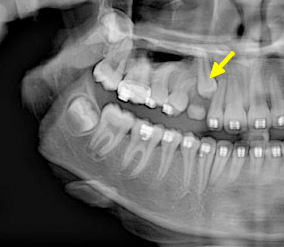 Although wisdom teeth are commonly removed in the case of impaction, the eye teeth are critical to the function and appearance of the bite. Thus, it is critical for these teeth to emerge and be properly positioned for a lifetime of oral health. Generally a dentist will determine the cause of an impaction, and recommend the patient to an orthodontist or an oral surgeon. An orthodontist can place braces on the teeth to allow for eruption, and an oral surgeon may need to remove any extra teeth or growths that are blocking eruption of the tooth. Often the orthodontist and oral surgeon work together to achieve results. During the oral surgery procedure, the gum is lifted to expose the impacted canines, and a bracket is bonded to the teeth. Any baby teeth that are present are removed. The gum is then returned to its original location and sutured back into place. Over the next several months, the tooth is guided into place using the special bracket. In cases where the patient is too old (over 40), there is a greater chance of the impacted tooth being fused into position. In these cases, the option may be to remove the tooth and replace it with an implant or fixed bridge. Surgery for an impacted tooth is performed in our office, generally using Intravenous (IV) Sedation and local anesthesia.